In the winter of 2013 I had the privilege of travelling into Syria to see the country for myself. I saw the situation on the ground, was able to speak with rebel fighters and refugees, and I tried to help in any way I could. After 10 months of writing and editing, my experiences and my thoughts on the conflict have been published into my first book. 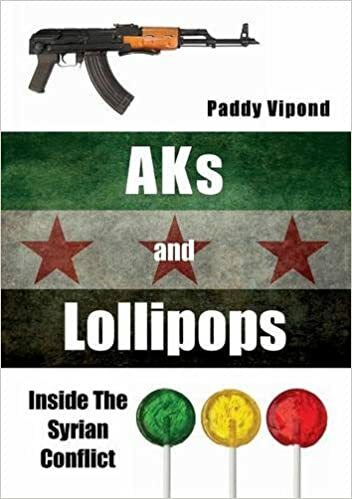 AKs and Lollipops has grown from the notes that I kept during my brief time inside war-torn Syria. There are personal stories from the people I met, first hand accounts of the war and its effects, and photos from the regions that I visited. Unlike media portrayals of the war, I had no objective or agenda to push. What I wrote was honest and uncut. I shant deny that AKs and Lollipops is a subjective account. I know the first rule of journalism is that you are meant to be fair and objective, but so much of Syria’s war is anything but. On the cover you will find the Green, White and Black of the flag that anti-Assad forces have adopted, and I have no shame in saying that these are the people that have my support. Whilst I was in Syria it was the soldiers of the Free Syrian Army (FSA) that treated me like one of their own. I slept in their homes, shared their food, and travelled with them around the country. Anyone that has been travelling can attest to the incredible generosity that strangers often provide, and even in the bleakest of climates, the people of Syria were no different. Wherever I went, from soldiers’ homes to refugees tents, I was greeted with smiles and offers of food, tea or cigarettes. What little these people had they were more than willing to share. This is testament to the character of the Syrian people, that even at a time such as this, where the world seems to have forgotten about them, they have not forgotten about the world. For the average UK citizen, attempting to imagine what life has become for Syrian people is impossible. Even when I was able to walk in their shoes, albeit briefly, it was still not enough for me to come to terms with the tragedy that has been unfolding these last four years. A country which was once the jewel of the Middle East, boasting exquisite architecture, culture, and history, is now nothing more than a graveyard of ambition, hope, and people. Nobody knows when the conflict is likely to end, but it is widely believed that it will get worse before it gets better. As the stalemate deepens, every inch that is able to be prised away from the opposition will come at a heavier price. It is 21st century trench warfare with neither side able to deliver the knockout blow. It may be because of this stagnation that the barbarity of this conflict only seems to increase with each passing month. Amidst it all, caught in the never-ending crossfire, are those struggling to continue to live. Like the international action, aid to the Syrian people has been woefully inadequate. Hundreds of billions of pounds of investment will be needed to bring the country back to its former glory, and still Syria continues to regress day after day. The average life expectancy has dropped by two decades, diseases that were eradicated from the country have returned, and a whole generation of children have been deprived of the education they deserve. It is often said that Syria represents the greatest humanitarian crisis since the Second World War, and it is plain to see why. For 70 years the world has not seen destruction and suffering on such a level, and yet little seems to be happening to try and stop it. Those in need of humanitarian aid in Syria now number more than the total combined population of Northern Ireland, Scotland, and Wales. It is my hope that AKs and Lollipops goes some way to highlighting the plight of Syria’s people. Refreshing our collective memory that there exists a world away from the headlines and news reports where real people are forced to exist in such a hellish climate. It is only due to the lottery of life, the privilege of birth, that you and I are sat here and not elsewhere in the world. I no more deserve the position I have found myself in than the children in Syria deserve theirs. I wake each morning to the sound of an alarm on a mobile phone, they struggle to sleep peacefully every evening as rockets, shells and gunfire punctuate the night. After night, after night. All of the money that I make from book sales will be donated to charities dealing with the Syrian crisis. AKs and Lollipops is available in paperback or kindle formats and can be found here on the amazon store.